A 52-year-old obese white man was referred to our hospital because of increasing fatigue and exertional dyspnea. He had been well until 5 months previously. The patient had a medical history of dyslipidemia and hypertension. His hypertension was poorly controlled despite a combination of antihypertensive agents (beta-blocker and angiotensin receptor blocker). Physical examination showed blood pressure 140/90 in both arms, a heart rate of 74 beats/minute and an apical gallop sound (S4). Femoral pulses were palpable bilaterally but weak and delayed compared to the brachial pulses. His echocardiogram showed bicuspid aortic valve with minimal regurgitation, segmental wall motion abnormalities and mild mitral insufficiency. 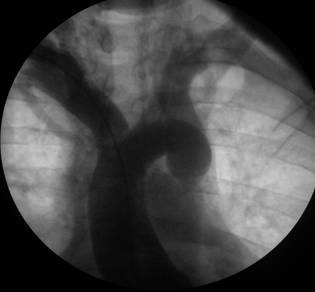 A cardiac silhouette at the upper limits of normal and notching of the ribs were observed on the chest radiography. Due to the significance of the cardiac dysfunction and his clinical presentation, the patient underwent a cardiac catheterization to evaluate his coronary artery disease. The left ventricular ejection fraction was significantly reduced (Ejection fraction: 30-35%). There was no evidence of mitral valve prolapse. Aortography showed a mildly dilated aortic root, minimal aortic valve insufficiency and a significant ring-like stenosis in the thoracic descending aorta (Figures 1 and 2). The gradient through this stenosis measured 80 mmHg. The coronary angiography was negative for significant focal coronary artery obstruction. The patient was then referred to cardiothoracic surgery. The procedure was done via left posterolateral thoracotomy from the fifth intercostal space. Since, the collaterals were well recognized before surgery, the procedure was achieved without major bleeding and any adverse event. Furthermore, the patient was adult and any minor bleeding has not resulted in requirement of blood transfusion. The coarctated segment was resected totally and end to end anastomosis of thoracic aorta was performed in a standart fashion. The coarctated segment was short in our patient and it was not difficult to get the two ends together without tension on the anastomosis so that we do not considered an interposition graft. The cross clamp time was 23 minutes and because the collaterals were left intact, any malperfusion syndrome has not occurred. Total hospital stay after procedure was only four days. After the 1-year follow-up visit, the patient was in good clinical condition. Aortic coarctation is a congenital vascular lesion typically diagnosed in early life, accounting for 5 to 10% of all congenital cardiovascular malformations1 but may go undetected well until adulthood2. It manifests as childhood hypertension, lower extremity fatigue or weakness, diminished lower extremity pulses and/or congestive heart failure. Diagnosis is usually based on clinical suspicion and physical findings3. The latter include blood pressure difference between the upper and lower extremities, pulse delay and systolic murmur over the thoracic spine. Other manifestations can include bicuspid aortic valve systolic ejection sound and/or murmur and neurological complaints. Prognosis and survival depend on the disease severity and patient's age at the time of correction. Death in these patients is usually due to heart failure, coronary artery disease, aortic rupture/dissection, concomitant aortic valve disease, infective endarteritis/endocarditis, or cerebral hemorrhage4,5. There are few reports of patients first diagnosed with uncorrected aortic coarctation at very late age2,6,7, Treatment consists of aggressive hypertension therapy, endocarditis prophylaxis and corrective treatment for coarctation lesions with a high gradient8. In this case report, we present aortic coarctation with bicuspid aortic valve in a 52-year-old male. 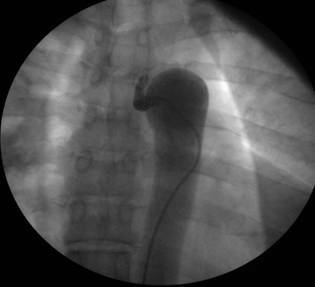 Our patient was relatively asymptomatic until he presented with chest discomfort, fatigue and dyspnea in his fifth decade of life.